"[During 2016] Nelson received thousands of e-mails, letters, and phone calls from concerned constituents asking for his support of H.R. 1301. Numerous meetings were held with his senior staff in an effort to move the legislation forward," ARRL said in a news release. "Negotiations, which led to an agreement with the Community Associations Institute (CAI), the national association of homeowner's associations and publicly supported by CAI and ARRL, were brushed aside by Sen. Nelson as irrelevant." In a final meeting with Nelson's staff as the 114th Congress neared adjournment, it became clear that no matter what was said or done, the Senator would oppose the bill and refuse to allow it to move forward. Because the measure had not been put on the floor schedule, the only way it could have passed the Senate would have been through a process called "unanimous consent." A Senate member may request unanimous consent on the floor to set aside rules and expedite proceedings. If any single Senator objects, though, the request is rejected. Work already is under way by the International Amateur Radio Union (IARU) to address agenda items of interest to Amateur Radio during the run-up to the 2019 World Radiocommunication Conference (WRC-19). The International Telecommunication Union (ITU) convenes WRCs every 3 or 4 years; the last WRC was in 2015. The IARU's prime focus is spectrum privileges -- gaining or retaining spectrum for the Amateur Radio services and spectrum protection -- making sure that amateur spectrum remains available for use and free from serious man-made interference. The IARU works within international standards organizations and with regional telecommunication organizations to accomplish its goals. Completed revisions to Recommendation ITU-R M.1732 dealing with parameters to be used in sharing studies regarding the compatibility of Amateur Service operations with other radio services, mainly in the 50-54 MHz band. Continued work on sharing and compatibility studies required for WRC-19 Agenda Item 1.1, which addresses an Amateur Radio allocation at 50-54 MHz in ITU Region 1, in common with what already is available in Regions 2 and 3. Sharing studies consider criteria under which spectrum can be shared among different radio services. Addressed other WRC-19 agenda items that could impact the Amateur Service. Updated the WP5A web document, "Guide to the use of ITU-R texts relating to the Amateur and Amateur-Satellite services." 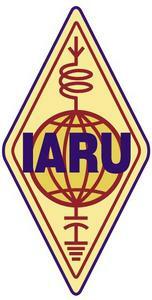 IARU will continue to be active in ITU and regional telecommunication organizations as preparations go forward for WRC-19. In the coming weeks, IARU plans to participate in CEPT's Conference Preparatory Group for WRC-19 and in its Project Team meetings. Read more. "Antenna System Troubleshooting" is the topic of the latest episode of the "ARRL The Doctor is In" podcast. Listen...and learn! The ARRL National Parks on the Air (NPOTA) program is on the verge of making history. With less than 2 weeks to go until the program concludes on December 31, NPOTA Activators have made more than 995,000 contacts from National Park Service units this year, and it appears certain that the count will top 1 million before year's end. National Parks on the Air has proven to be one of the most successful and popular on-air activities ARRL has ever created. Tens of thousands of radio amateurs made at least one contact with an NPOTA Activator in 2016, and nearly 1,400 Activators went out and transmitted from a park. One million contacts from portable operations -- many of them using under 100 W and simple wire antennas -- is an amazing feat. Congratulations to every NPOTA Activator who hit the trail this year and helped NPOTA to reach its goal! But the fun isn't over yet! More than 30 NPOTA activations are scheduled through the end of 2016, including Fort Scott National Historic Site in Kansas, and the Amistad National Recreation Area in Texas. NPOTA Activators have promised a burst of activity all across the country in the final week, especially all day on Saturday, December 31. Work as many NPOTA stations as you can! Radio amateurs in the US and in Scotland have reenacted the first successful transatlantic reception of a shortwave Amateur Radio signal nearly a century earlier. 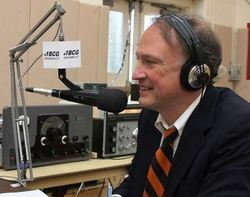 Special event station N1BCG in Greenwich, Connecticut, and GB2ZE in Ardrossan, Scotland, completed contacts on SSB and on CW during the December 11 event. 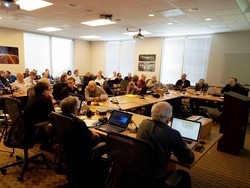 ARRL, the Radio Society of Great Britain (RSGB), and the Radio Club of America (RCA) partnered to support the activity, organized by ARRL CEO Tom Gallagher, NY2RF, and Clark Burgard, N1BCG, who loaned his history-rich call sign for the occasion. On December 11, 1921, in Ardrossan, Scotland, reception of a radio signal transmitted from an RCA test station -- located in a small shack on the Greenwich, Connecticut, property of Minton Cronkhite, 1BCG -- helped to usher in the age of global communication. In Scotland, American Paul Godley, 2ZE, clearly heard the signal using a receiver of his own design. "These events are fun, because they're timely and cause us to focus on the history and on the people who made history," Gallagher said. "We were very pleased with the tenor of it and with the media coverage, and we were happy to make the connection with GB2ZE, although we would have preferred to have made it on 160 meters, where it would have been closer to the frequency used in 1921." The 1921 transatlantic test, on CW, was conducted on a wavelength of 230 to 235 meters (about 1.3 MHz). The ARRL transatlantic tests proved the value of the shorter wavelengths, which had long been considered worthless for long-distance communication. Burgard spoke on 20-meter SSB with GB2ZE, operated by Jason O'Neill, GM7VSB, in Ardrossan. A bit later, ARRL Field Services Manager Dave Patton, NN1N, chatted with GB2ZE on CW. "After working GB2ZE on 20 meters, I was reminded of how much of a challenge the RCA ops had using 200 meters," Patton said. "Hearing signals in Europe from across the Atlantic had to be a tremendous thrill for Godley and the others listening." The first message sent by Burgard from Greenwich to Ardrossan on Sunday morning repeated the original 1921 text. Patton retransmitted the message 30 minutes later on CW. Describing the special event as "a rewarding experience," Patton said the entire team worked together to build a Field Day-style station in wintry weather. The complement of equipment included what he called "a few fully armed vintage AM stations," as well as modern gear. Among the older pieces was a 1950s-era transmitter owned by rocker Joe Walsh, WB6ACU, of the Eagles. Bruce Godley Littlefield and his sister Janice Taylor are grandchildren of Paul Godley, 2ZE, who was at the Ardrossan, Scotland, receiving station in 1921. The antennas were simple dipoles. With about a dozen operators active, the special event logged nearly 525 contacts, more than 100 of them on AM, through conditions that were only fair. To highlight the historical nature of the occasion, Godley's grandchildren Bruce Godley Littlefield and his sister, Janice Taylor, visited, and Littlefield brought his grandfather's complete log books of the experiment, as well as numerous photos and letters from ARRL. "We enjoyed the opportunity to reconnect the Godley history with that of ARRL and the Radio Club of America," Littlefield said afterward. Read more. 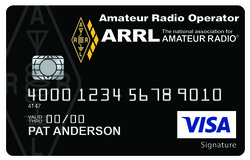 Apply for the ARRL Visa Signature® Card and, upon approval, enjoy a long list of great everyday benefits. Plus now, as a special gift, you'll also earn an additional 5,000 Bonus Points (subject to credit approval) on your account after you make your first purchase. Merchant upgrades, special offers, savings, and more. Radio amateurs provided emergency communication support during the response to a December 7 magnitude 6.5 earthquake in Indonesia's Aceh Province. The death toll was reported at 100, with nearly 300 injured. The IARU Region 3 Disaster Communications Committee's Dani Hidayat, YB2TJV, reported that it took 2 hours for the ham radio group from the Indonesian Amateur Radio Organization (ORARI), Aceh Region, to reach the earthquake zone. A team led by Abdullah Ali, YB6AA, and Ismul Huda, YB6AG, and others supported emergency communications in the field at Pidie Jaya. Zainal Abidin, YC6FZ, was injured when his house collapsed, but his family was said to be safe; Huda took Abidin to the Banda Aceh Hospital for treatment. YB2TJV reported that 40 meters and 2 meters were used for emergency traffic. The quake flattened houses and buildings, caused infrastructure damage, and left large cracks in roads in the worst-affected districts of Pidie Jaya and Pidie. ARISS-International delegates celebrated 20 years of Amateur Radio on the International Space Station (ARISS) when they met November 15-18 at the International Space Center Conference Facility in Houston, Texas, to continue planning for the years ahead. More than 50 delegates and guests from Russia, Japan, Italy, Germany, the UK, and North America took part, and teleconferencing let individuals unable to attend in person to join the proceedings. An international group interested in installing and operating an Amateur Radio station on the ISS first met in November 1996 at Johnson Space Center, and ARISS was born as a result of that gathering. "The international partners celebrated the dedication and contributions of volunteers who have sustained it over the challenges of the past 20 years," said ARRL Education Services Manager Debra Johnson, K1DMJ, who attended on behalf of ARRL. "It was clear that the vision to make the excitement of space exploration accessible to students and the challenge of participating in space activities through Amateur Radio is still very much alive." Rosalie White, K1STO, also represented ARRL at the gathering. Hardware sessions discussed finalizing designs for the Kenwood TM-D710GA dual-band radio and interoperable radio system, which includes a new power supply. Participants also heard a review of educational outcomes. Ronny Risinger, KC5EES, a government teacher at Language Arts and Sciences Academy in Austin, Texas, discussed classroom integration of ham radio and student outcomes. Delegates also saw a demonstration of a standardized HamTV ground receiver constructed by Ciaran Morgan, M0XTD. "A vision of Amateur Radio in space exploration beyond the ISS was also discussed and action taken to develop a position statement about the program's intention to be involved in future journeys into space," Johnson recounted. "This position statement will be used as a basis for discussions with key industry leaders involved in projects in development for the next journeys to the Moon and to Mars." The cargo ship carrying the Tancredo-1 "TubeSat" -- so called because of its cylindrical form factor -- launched on schedule from Japan on December 9. Built by 10- to 14-year-old middle schoolers in Brazil, Tancredo-1 carries an Amateur Radio payload. Tancredo-1 went into space inside the TuPOD TubeSat deployer, which is expected to be ejected into space from the ISS on December 19 by the JEM Small Satellite Orbital Deployer (J-SSOD). It will, in turn, eject Tancredo-1 into orbit on December 21. Once in space, Tancredo-1 should start transmitting telemetry. Tancredo-1 is the first satellite of the UbatubaSat Project, a STEM initiative at Tancredo Neves Public School in Ubatuba, São Paulo, Brazil. The project is supported by the Brazilian Institute for Space Research and the Brazilian Space Agency. Tancredo-1 will initially have the same orbit as the ISS. 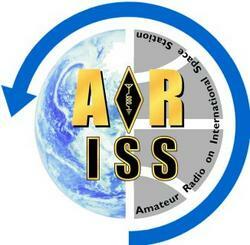 The UbatubaSat project team and AMSAT-BR has asked for reception reports. Tancredo-1 will transmit on 437.200 MHz using 1,200 bps AFSK AX.25. Submit reports via e-mail. According to information filed with the IARU Satellite Coordinator, Tancredo-1 has an onboard voice recorder that will transmit a message chosen through a competition among students from schools in Ubatuba. 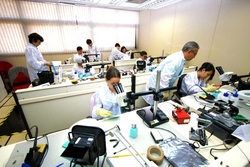 Young students learn about satellite assembly in the Brazilian Institute for Space Research lab. 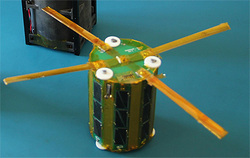 The December 9 launch also carried Turkey's UBAKUSAT CubeSat. Equipped with a 145/435 MHz (V/U) SSB/CW Amateur Radio transponder and a CW beacon, UBAKUSAT will be deployed from the ISS next year. The satellite is being developed by Istanbul Technical University's Space Systems Design and Test Lab (SSDTL) along with the Turkish Amateur Satellite Technologies Organization (TAMSAT) and other entities, including the Ministry of Transportation, Communication and Maritime, in collaboration with the Japanese government. Broad changes in Mexico's radiocommunication regulatory environment 2 years ago continue to hinder Amateur Radio licensing there and still do not provide reciprocal permission for non-Mexican radio amateurs to operate south of the border. Mexico's International Amateur Radio Union (IARU) member society, the Federation of Mexican Radio Amateurs (FMRE), has been working with the new regulator, the Federal Telecommunications Institute (IFT) to craft more Amateur Radio-friendly licensing procedures and regulations, and there has been a little positive movement. The new regulatory regime considers the radio spectrum as an exploitable resource, and all former Amateur Radio regulations have been deemed null and void. FMRE's new president, Alfonso "Poncho" Tamez, XE2O, is spearheading the society's negotiations with the IFT. At FMRE's National Convention in September, IFT Commissioner Adriana Labardini announced to loud cheers that her agency will get Amateur Radio licensing going again, after a 2-year delay. FMRE has estimated that of the 3,500 existing Mexican Amateur Radio licenses in place before the new law went into effect, more than 1,000 have expired and their renewal was put on hold until the IFT works out procedural details. She said the IFT expects to process more than 800 applications by year's end, with another batch of more than 1,400 to follow. An initial license will cost about $30 US. The status of Amateur Radio clubs has also been put in limbo by the new regulatory regime. A revised IFT draft of Amateur Radio licensing procedures included specific provisions to grant Amateur Radio operating permission and to make licensing requirements more consistent with the nature of the Amateur Radio service. But significant gaps still exist. At this point, it is not even necessary to take an examination to obtain an Amateur Radio license -- called a "concession" -- in Mexico. 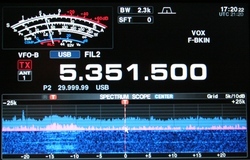 While the IFT has not yet determined what to do about foreign radio amateurs wishing to operate in Mexico, the agency has received 45 petitions to do so and is considering how it can issue permits; a foreigner cannot obtain a license under the new law, but may be given permission to operate as XE#/<home call sign>. Further, no regulations are in place regarding power output, license classes, licensing zones, interference, and other regulatory aspects. Read more. A photo caption in December 8 edition of The ARRL Letter incorrectly identified the radio amateur holding the Worked All States certificate he earned during the 2015 ARRL 10 Meter Contest. The op is Milt Withers, AD5XD, of Richardson, Texas. Our apologies! ARRL Rookie Roundup CW is Sunday, December 18: The 2016 CW Rookie Roundup is right around the corner on Sunday, December 18. Rookies can take up their Morse keys (or keyboards) and "pound some brass" in pursuit of Rookies and Non-rookies alike. Rookies -- anyone licensed for 3 years or less -- get on the air and call "CQ RR," so other participants can find them. Grizzled CW veterans call "CQ R" (CQ Rookies). Veteran operators are encouraged to invite new hams to use their stations and give CW a try, or to invite several newbies over and have a multiop. This is also great practice for Straight Key Night on New Year's Eve, so limber up those sending skills and help to introduce the joys of CW to a new generation of hams! This also an excellent opportunity to try out contesting in an event designed for newcomers. Rookie entrants are encouraged to read "HF Contesting - Good Practices, Interpretations, and Suggestions." To register teams or submit scores, visit the ARRL Rookie Roundup Contests web page. 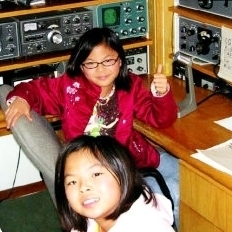 Next Kids Day is Saturday, January 7: The first Saturday in January is Kids Day -- the time to get youngsters on the air to share in the joy and fun that Amateur Radio can provide. Kids Day gets under way on Saturday, January 7, at 1800 UTC and concludes at 2359 UTC. Sponsored by the Boring (Oregon) Amateur Radio Club, this event has a simple exchange, suitable for younger operators: First name, age, location, and favorite color. After that, the contact can be as long or as short as each participant prefers. Kids Day is the perfect opportunity to open your shack door and invite kids over to see what Amateur Radio has to offer. Details are on the ARRL website. Dave Kalter Youth DX Adventure Offering Complete Ham Station to Essay Contest Winner: The Dave Kalter Youth DX Adventure (YDXA) has announced an exciting essay competition for young radio amateurs. Due to the generosity of the 2016 raffle winner Paul Ewing, N6PSE, and the co-founders of the YDXA, the winner of the essay contest will receive a complete Amateur Radio station. The prize includes an Alinco SR8T HF, a 12 V, 30 A power supply (Jetstream or equivalent), vertical antenna (Jetstream JTV680 or equivalent), and 100 feet of coax feed line fitted with PL-259 connectors. Eligibility is limited to Technician class or higher US licensees 12 to 18 years old, residing in the 48 contiguous US states. Entrants are to submit an essay of up to 500 words describing their involvement in, personal future plans for, and importance of Amateur Radio. All entries must be postmarked (or system dated, in the case of e-mail entries) by December 23, 2016. The winner will be announced no later than January 31, 2017. Entrants should adhere to all contest rules. Tad Cook, K7RA, Seattle, reports: Average daily solar indices over the past week were lower than the previous 7 days, with the average daily sunspot number declining from 40.9 to 13, and the average daily solar flux dropping by 10 points from 82.2 to 72.2. Geomagnetic indicators were higher, with the average daily planetary A index rising from 4.9 to 13.3, and the mid-latitude A index from 3.4 to 9. 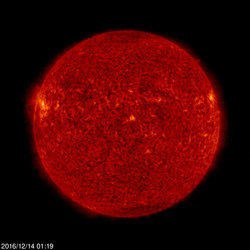 Predicted solar flux is 70 on December 15-17; 75 on December 18-20; 80 and 86 on December 21-22; 88 on December 23-27; 86 on December 28-29; 88 on December 30-January 1; 86 on January 2-3; 84 and 82 on January 4-5; 80 on January 6-7; 73 on January 8-9; 75 on January 10-14; 82 on January 15-16; 86 on January 17-18; 88 on January 19-23, and 86 on January 24-25. Predicted planetary A index is 5 on December 15-16; 8 on December 17-18; 15 on December 19-20; 25, 30, 12, 10, and 8 on December 21-25; 5 on December 26-January 1; 8, 10, 20, and 22 on January 2-5; 16 on January 6-7; 8 on January 8; 5 on January 9-12; 8 on January 13-14; 12, 16, 22, and 30 on January 15-18; 12, 10, and 8 on January 19-21, and 5 for the remainder of the 45-day forecast. Sunspot numbers for December 8 through 14 were 14, 12, 0, 13, 13, 14, and 25, with a mean of 13. The 10.7-centimeter flux was 74.8, 72.9, 72.2, 71.4, 70.8, 71.2, and 72.4, with a mean of 72.2. Estimated planetary A indices were 23, 25, 16, 15, 6, 4, and 4, with a mean of 13.3. Estimated mid-latitude A indices were 14, 18, 11, 11, 5, 2, and 2, with a mean of 9. Send me your reports or observations, especially from the ARRL 10 Meter Contest.